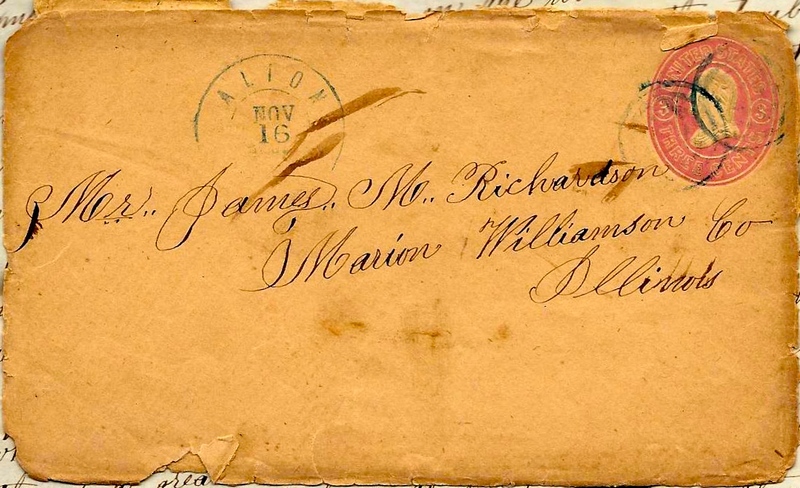 1863: James Monroe Richardson, Jr. to James Monroe Richardson, Sr. These POW letters were written by James Monroe Richardson, Jr. (1844-1896) to his father, James Monroe Richardson, Sr. (1820-1895) of Saline Township, Miller County, Missouri. James Sr. was married to Frances (“Frankie”) Ann Stephens (1827-1866) in 1843. James Jr. mentions his sister Martha Ann Richardson (1848-1920) in the letter. In Miller County records, James M. Richardson’s 5 slaves were valued at $2400 per the assessor’s books. At one time James and Frances (Stephens) Richardson, their seven children, and five slaves lived in the Tuscumbia area before the Civil War. Among the Union Provost Marshal Papers in Missouri is the record of a letter written by James M. Richardson, Sr. on 10 June 1863 to Gov. Gamble stating that he was arrested for having southern sympathies and claiming that his property in Miller County, Missouri, had been confiscated and scheduled to be sold by Lieut. Babcock without due process of law. The letter was written from Marion, Illinois, which is where this letter was sent. James was imprisoned at Alton until 29 February 1864 when he was transferred to the prison at Fort Delaware. He arrived there on 5 March 1864. He was probably housed in Division 16 of that prison — a division with several other Missouri soldiers. 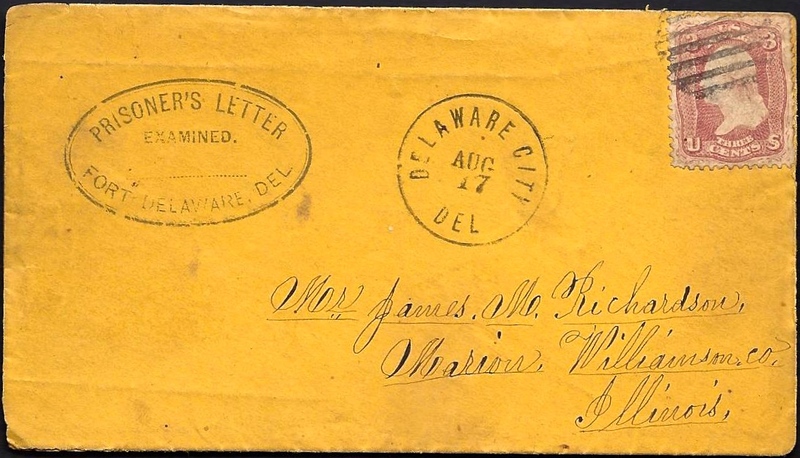 Microfilmed records pertaining to Fort Delaware tell us that James was admitted to the Fort Delaware Post and Prison Hospital on 6 June 1864 and discharged back to the prison barracks on 22 July 1864. The cause for treatment was not given. James was paroled for exchange on 27 February 1865, one of 1,018 paroled prisoners of war loaded aboard the Steamer Cassandra and sent off that day to the James River. Union guard Private A. J. Hamilton from the Fort Delaware garrison accompanied these prisoners south and reported on their delivery. Hamilton wrote on 1 March 1865: “At noon, we came to anchor off Aiken’s Landing. Lieutenant Lewis went ashore and reported to Colonel Mulford, found that the Rebs were unable to furnish transportation and unable to receive our prisoners and we would have to wait.” On 2 March 1865, Hamilton wrote: “Early this morning, Lieutenant Lewis went ashore, got orders to run alongside the [Steamer] State of New York, to put all the Rebels who were able to walk a few miles ashore. 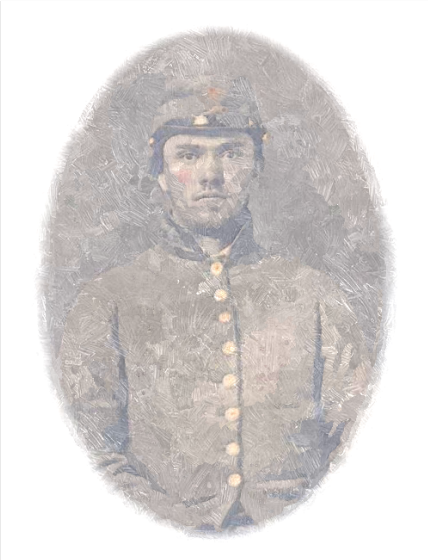 We have got rid of 500 of them and they struck out for Dixie on foot.” CMSRs show that there were several other Missouri soldiers paroled at Fort Delaware on 27 February 1865 who were released at Aiken’s Landing on 2 March 1865. James’ name appears on a Roll of Paroled Missouri Soldiers who arrived at Richmond 3 March 1865. They were forwarded by Lieutenant R. S. Bevier, a Missouri officer present in Richmond, to Brigadier General Francis M. Cockrell who was commanding French’s Division of the Army of Tennessee at Mobile, Alabama. Cockrell’s troops were involved in the defense of Fort Blakely which fell on 9 April 1865. The City of Mobile was occupied on 12 April 1865. Family oral history claims that James Jr. was a tall, red-headed farmer, school teacher, and merchant. He is reported to have gone to Oklahoma on the first train in April 1889 and lived there until his death at the age of 52. He was married in 1875 to Vania Barnes and had two children. I’d like to thank Hugh Simmons of the Fort Delaware Society for assisting in the research of Prisoner of War James M. Richardson. They have updated their research folder pertaining to him so that others who might want to research this soldier may learn more. I have the pleasure of sending you a few lines which leaves me well, hoping when this comes to hand that you may be well. I have nothing of importance to write. I received them articles of clothing you sent me — also all of the rest of things that evening. The drawers & coat is rather large which is no bad failing. I have just been pouring of my books which I am very well pleased with — especially the dictionary. It is so handy & useful that I think I can hardly be got to part with it. I will try to improve my time to the best advantage though circumstances are rather bad for learning here in the winter. But I have a very comfortable place for winter quarters. The trouble is where it is light enough, it is too cold to study. But I have light enough & it is tolerable comfortable. I and Joseph Adcock ² are bedding together or, as we say, we are married. Pa, you seem to meditate that I was a playing cards. You need not give yourself any uneasiness in regard to that for that is something that I do not follow here or anywhere else. You have good reason to fear the like for there is a great deal of that business carried on here but no so much as there used to be. I received a letter from sister Martha yesterday. All was well at home then. They tell me that several of the girls has married since I left but that does not amount to much. I want you to write to me frequently for I am glad to hear from you anytime. It was so long between times the last time that I had become uneasy about you, I will come to a close by sending my best best respects to you. ¹ “The Alton facility, with its 256 cells, was built to house 900 inmates, but during its use as a military prison during the Civil War, its average population was about 1,200, with a peak of 1,900 in January 1865. During the course of the war, 11,000 inmates spent time in this former penitentiary, which consisted of several block buildings surrounded by a high stone wall. It was located in the downtown area of Alton, just a few hundred feet from the Mississippi River. Since the city slopes toward the river, the prisoners were able to see much of the town, especially the bell tower for the Baptist Church, and many are said to have watched the hands of the clock on that tower as they waited for news of exchange or the war’s end. ² This is probably Joseph Adcock who served in the 5th Missouri Cavalry. I once more have the pleasure of sending you a few lines which leaves me well, hoping when this comes to hand that it will find you enjoying the blessings of life. I received a letter from sister Jane today dated the 19th inst. All was well at home. I have nothing of interest to write you for all is dull here at this time to me. You spoke of James Reed. Since I wrote to you in October, he had got a letter from home. Therefore, I did not mention it to you when you was up here. He is a nurse in the hospital & does not have much time for studying books. Concluded Nov. 27th. I received all of the money you sent me the same evening that I got the other articles. I am a making tolerable good use of my time with my books. If I should not understand some parts at once, I have plenty of friends that will explain it all to me at once for we have some very intelligent men here. I and my friend Joseph Adcock have some butter yet. He received a express package from home containing some eatables so we have faired very well since you was here. Pa, I take a great pride in writing in particular to you & Ma so I want you to write to me ofttimes. I will come to a close for this time. I have just received your very kind letter of the 5th inst. I was glad to hear that Ma is with you. You wanted to know whether to send me money or clothing. I can get clothing cheaper here than you could there but the trouble is to get the money. The boys has had money here a week or more & has not got it yet but will next week. The sutler has had doors locked for two days but will open on Monday next. You need not send me money or clothing until I write for it for the report here is that some of the prisoners are to be sent away from here & I hope that I may be one of the number. I would freely exchange my place here for one in any other prison & risk the chance of being worsted. I have just received a letter from Joseph Adcock but cannot answer it. We have a new order here prohibiting any correspondence with all but parents, brother, sister, wife, son, or daughter. This leaves me is some better health than when I wrote to you before. I got the four stamps you sent & was glad to get them for they are very scarce here. 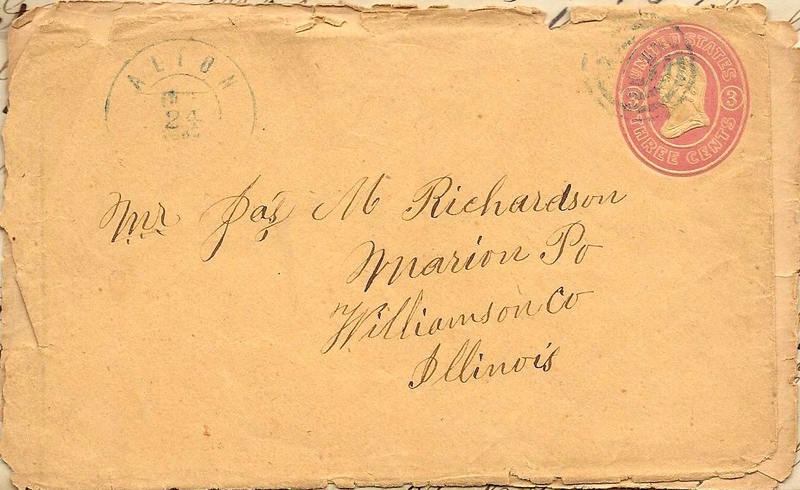 This last letter has no envelope but the contents tell us it was written by James M. Richardson, Sr. to his daughter Jane and her husband who are residing on the Missouri homestead in Miller County, abandoned by her father during the Civil War. In this letter, he informs Jane that her sister Martha has married and intends to return to Miller County, Missouri, take up housekeeping, and farming. He provides instructions on the division of his personal effects left in Missouri between his two daughters. No mention is made of James M. Richardson, Jr. in this letter but it included here because it is connected with the family. I write you a few lines which leaves us all well except your Ma, & she is better. We all hope when these lines comes to hand they may find you both in good health. Well Jane, your sister Marth & Joel has undertaken to make their fortune together & is going to live in Missouri. Therefore, you must try to help her & in [illegible] her all than you can. [Illegible] very young to undertake to keep house, & besides, has very little to commence with. Therefore, your Ma says for you to let her have the old plates & one of the dishes she left. She says for you to divide the glass tumblers & bowls equally with Martha & one of you have two of the glass jars & the other the molasses stand & the other jar. Martha is to have one of the flour barrels & one of the salt barrels. You must divide the molasses I left with Martha. You take one of the old tables and her the other. Martha is to have the pot. You take the clock [illegible] & give her the [illegible]. Give the bedstead your Ma left to Martha and she takes the bureau in lieu of a saddle. The dining table, small table, and stake dish is to still be mine though you can use one and her the other. One of you take the two tin pans and the other the tray. Divide the old chairs equal. Let Joel & her have house room. Joel is going to tend the upper place and I want him to have an equal share in the meadow & orchard. I have hired him to take care of the wheat. You can both have all that you can make. You will have to fix the fence so as to secure your crops. The girls can [illegible] the old tub wash board & meal sieve, and pick my geese time about & have the feathers. Give Martha the old tick I left. You take one of fire shovels & her the other. Martha is to have the waffle irons. Now Jane, I hope you & Martha will continue to live as you have done — kind and affectionate to each other. Your Ma says for you to not forget the promise you made about coming to see us. She says she thinks of you often as you do her and you must know I would be well pleased to see you. I have directed Joel to sell the wheat as soon as he can and pay you the money back for the corn that you failed to get. I would send it to you but I need all that I have & suppose you are not in much need. It shall be made right. I send the money by Joel to barter for the corn he was to [have] had. We are your affectionate parents as ever, — J. M. Richardson &c.
This entry was posted on Monday, October 13th, 2014 at 4:48 pm	and posted in Uncategorized. You can follow any responses to this entry through the RSS 2.0 feed.